USCG Members Judge Our Photo Contest — Aerial Innovations, Inc.
Colette initiated a monthly photography contest five years ago, and it involves everybody in the office -- Colette included! The first place winner receives a cash prize of $75, second place receives $50, and third place receives $25. The judge differs per month, and the one chosen cannot be a part of the contest, nor can they correlate certain photos with their photographer. This past month of July's topic was "Patriotism." The genre for the month prior was "Yellow." The winners and their photographs are shown below. Each month, there are around 18 photographs printed out 5x7 that are displayed at random. The winners not only receive cash prizes, but they also get their photographs displayed in the monthly newsletter sent out via E-mail! Of course, photography is an art, and the interpretation of the contest can vary. Since the subject was "Patriotism," not "American Patriotism," various photographs may be submitted. Although, much like the game "Apples to Apples," the judge has the right to his or her own interpretation, as well. In lieu of this month's subject, Colette decided to contact the closest US Coast Guard base.The designated day for judging the photos was July 25, and the day she decided for a change of plans was July 25. Spontaneity. She called the Coast Guard branch on Davis Islands, and presented this idea. She thought it would be even more special for the Coast Guards to judge this month's contest; her father was recently recognized for his service, and she attended his change of command ceremony in early July. This contest, albeit a little goofy, supports healthy competition within the office and brings us all together. The contest encourages those involved to rifle through old photographs, and find connections that maybe they didn't see before. "We're an aerial photography company," Eddy says. "This contest gives these guys an incentive to take different types of photos." Ian Foe, Aerial Innovations photographer, explains his take on the photo contests. Even though he generally tries to take new shots per contest, sometimes he sorts through old photographs. Going through old photographs helps remind him how he's evolved as a photographer. "Use my baseball photograph, for example," Foe says (see above.) "I was just flying by and didn't think it was in particularly patriotic. But going through my photos now, baseball is patriotic, and now I see this photo as a patriotic one. [This contest] re-contextualizes old work." Initially we were going to have Jessica, our senior administrator, judge the photographs the morning of so we could send out our monthly newsletter that day. Yet, fate didn't want that. Next Tuesday I was scheduled to drive to CGAS Clearwater, the Coast Guard base. Although, for E-mail purposes, the photos Jessica chose are shown below. Met by a service member at the gate, I was led to LTJG French, who is the Public Affairs Officer. I met with French and a group of Coasties who agreed to take time out of their day to judge our photographs; everybody was eager to get the ball rolling. LTJG French laughed about the phone call she received a week before about the unusual request from a member at the USCG Marine Safety Office in Davis Islands; he had received the initial call from Colette. The request was then forwarded to LTJG French's office. "He told me it was an unusual request, but I told him I was used to unusual requests," French explained. "He said, 'No this one is really unusual.'" Featured from left to right: LTJG Diane French, LT Andrew Connell, LTJG Ryan Stille, PA1 Michael DeNyse, PA2 Ashley Johnson, and PA2 Barry Bena. I placed the photographs on the table in no particular order, and the group simultaneously began to pick out their favorites. Since there were so many people judging the photographs, they had to agree on the top three. A tally list was initiated through the notepad, but it was later scrapped in replacement of the classic elimination system. The majority of the photos were placed in a separate pile, away from the remaining candidates. The group channeled their creative side, resulting in concentration and discussion of the photos. Some liked the American flag solo pictures, and some preferred the pictures featuring children. They reviewed why they liked certain images over others. Even though the group decided on a final three, the exact order was more challenging. Ultimately, a consensus was made. The child Captain America picture was chosen for first place, a piece submitted by Robert Bender. 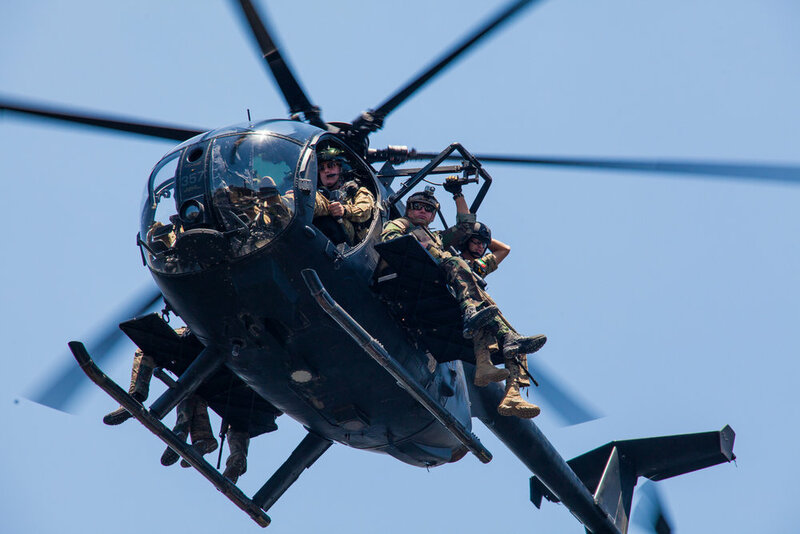 For the special ops training program, Robert took photographs for the event in downtown Tampa. The reaction was great. "It's an American-made helicopter," PA1 Michael DeNyse said. "What could go wrong?" Beyond the top three choices, the group went above and beyond. They chose a runner-up and an honorably mentioned. "It's a Coast Guard shout out," one of the members smiled. "I really liked that one," PA2 Barry Bena said. "It's out-of-box creative." Thank you for your service, and thank you for an enjoyable morning.